Are You Looking For a Seneca Deck Restoration Contractor Today? >We soon realized the need for not only a deck restoration provider, but also a need for a general pressure cleaning service that could and would take the time to perform the work properly. We have all heard of the horror stories about damaged wood, siding, windows etc….You know, the 2 hour SPLASH & DASH house wash? Well TASKMASTERS was born! We took the “PLUNGE”! We started out doing anything and everything to fill the days. From painting to minor plumbing repairs to rot repair to house washing. Whatever it took! (Hence the name TASKMASTERS). We soon found our niche in the deck restoration and pressure cleaning aspects of the business. Our work now consists of about 80% log and deck restoration and the remaining 20% residential and commercial pressure cleaning. For those of us that enjoy living in a Seneca log home, it's not only the true American dream but, there is something fulfilling about waking up with the natural smell of the wood. The massive logs and beams give a sense of safety and security. And just the rustic nature takes you away from the hustle and bustle of the busy lifestyle many live today. With all the advantages of log home living, like everything else, there are trade-offs. Most Seneca log home owners, by no fault of their own, are not fully aware of all that is required to properly maintain their homes. Sun, wind, water and insects are a constant threat to the integrity of the home. 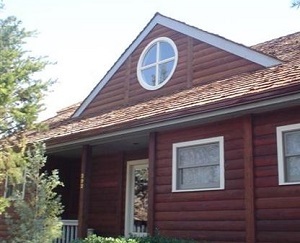 While most log homes are finished with semitransparent stains to reveal the beauty of the wood, compared to semi solid and solid stains, they offer the least protection from the elements. It must be taken into consideration when choosing a new finish what is important to the homeowner. If your Seneca log home is the permanent residence, then the owner has the ability to perform routine inspections of the logs, trim, caulking and chinking and overall appearance from time to time. This will allow more options when deciding what type of sealer to apply. State of the art equipment knowledge and experience provide our pressure washing contractors with the tools to safely and effectively clean any surface. We can increase or decrease the pressure settings on our equipment to meet the needs of the current task at hand. The very first impression that a visitor forms about your property is based on the appearance of the exterior. Most Seneca homes truly appreciate the value of great architecture and well-manicured landscaping. Often however homeowners give little consideration to the proper cleaning and maintenance of their exterior siding, gutters, exterior wood, masonry and concrete. Even if you are not painting your Seneca home, you should be washing your house at least once a year. Power washing your home spruces up the exterior of the home and makes it look much cleaner than before. Borate has the ability to diffuse into the wood to various depths depending on the density of the wood and moisture content. While dry wood will accept more Borate, it will penetrate deeper into wet wood and in general, with soft woods, this can be as much as a half inch. It must be applied to bare wood, meaning any existing stains or sealers must be removed. Two spray applications are recommended with the first being allowed to dry before applying the second. After the solution has had ample drying time, a good quality sealer should be applied to prevent the borate from leaching back out of the wood. Therefore, during the log home restoration process; after the house has been stripped and neutralized to prepare for sealing, but before the actual sealing, the Borate is applied. Although, not necessarily a hard process, an experienced professional should be hired. They will have the knowledge to properly mix the solution and apply it according to industry standards as well as the application equipment to perform the job safe. If you're looking for a professional log home restoration contractor in Seneca, then give us a call 252-266-9457 or complete our online request form.